•Decors: White, white-ash*, beech*, oak*, nut limed* with full lamellas or – as Eurostar glass – with structured acrylic glass inserts in white and oak* and acrylic glass inserts with satin-finish lines in white. •Standard height 205 cm, can be shortened as required. •Standard width to 83 cm, with additional lamellae to 150 cm extendable. •Lockable plastic latch with key, locking device while door is opened. •Including casing to cover of the upper sliding rail. •Lamellae from 9-mm-, double-walled plastic profiles. •Joint link of long-term-elastic soft plastic and maintenance-free special gliders for a long-standing, noiseless using. 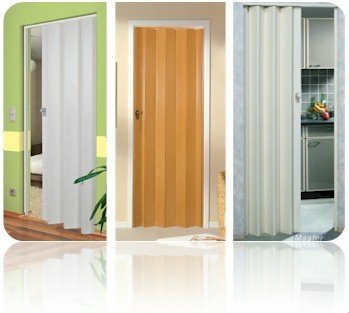 Colour: Beech Material: Plastic material, including adjustment which keeps the door in the open position. Lockable handle Properties: one-wing Max. Measurement: 205 x 83cm, one-wing, expandable to 205 x 150 cm with extra lamella Extension Panel: Yes Folding door height can be reduced/..
Colour: White Material: Plastic material, including adjustment which keeps the door in the open position. Lockable handle Properties: one-wing Max. Measurement: 205 x 83cm, one-wing, expandable to 205 x 150 cm with extra lamella Extension Panel: Yes For any technical questions please ..
Colour: White with glass panels Material: Plastic material, including adjustment which keeps the door in the open position. Lockable handle Properties: one-wing Max. Measurement: 205 x 83cm, one-wing, expandable to 205 x 150 cm with extra lamella Extension Panel: Yes For any technical..
Colour: White Ash Material: Plastic material, including adjustment which keeps the door in the open position. Lockable handle Properties: one-wing Max. Measurement: 205 x 83cm, one-wing, expandable to 205 x 150 cm with extra lamella Extension Panel: Yes Folding door height can be redu..
Colour: Beech Properties: Extension Panel for use with the Eurostar Beech Folding Door Dimensions: 12cm x 205cm ..
Colour: White Properties: Extension Panel for use with the Eurostar White Folding Door Dimensions: 12cm x 205cm ..
Colour: White Ash Properties: Extension Panel for use with the Eurostar White Folding Door Dimensions: 12cm x 205cm ..